Although hockey is his favorite, Richie really loves all sports. With the change of the seasons, baseball and golf are becoming more popular around here. 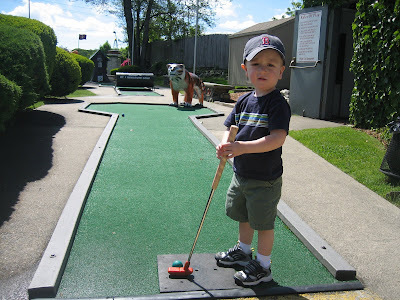 So when Daddy and Richie had some time alone they went to the mini golf course to play some "real" golf. I guess he loved the course (the windmills, etc) and getting to pick the color of the ball to play with! 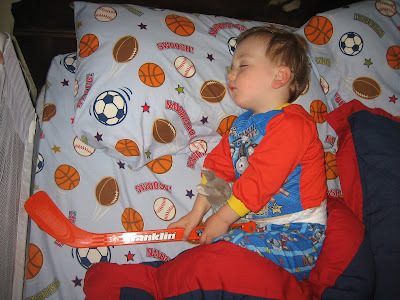 I know I mention it a lot, but this picture tells all......Richie is ADDICTED to hockey. This is how we found him sleeping HOURS after he had gone to bed. He takes his stick to bed almost every night, and he obviously spends the night dreaming about playing. 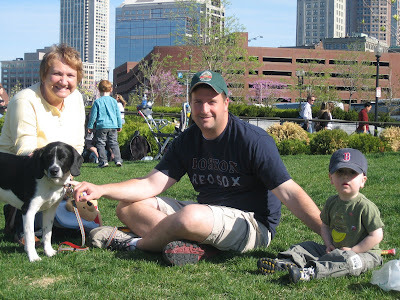 We had a great Memorial Day weekend with good weather so lots of time spent outside bbqing with friends. 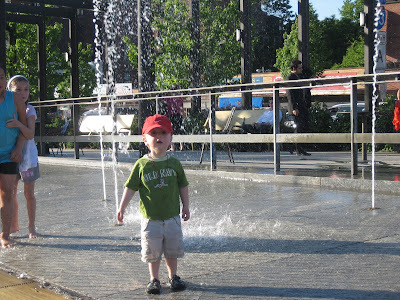 I have been bad about taking pictures so the only one I have is of the fountains (on the Greenway at the end of our street) which are finally turned on for the season. We have already been every day while we wait for the baby. I am sure we will spend lots of time here again this summer. 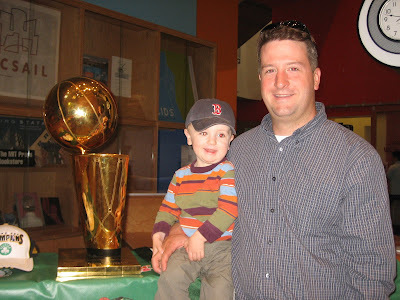 The 2008 Celtics NBA Championship trophy was at MIT so we made sure to go and see/touch it. As you can see, Richie was more than impressed. Especially with the size! We had a wonderful weekend (2 whole nights!!) in New Hampshire for Kevin and Joanna's wedding. Babci babysat Richie and Erin and Matt babysat Regina. So we were completely childless for a whole weekend on beautiful Lake Winnipesaukee with a bunch of our friends. 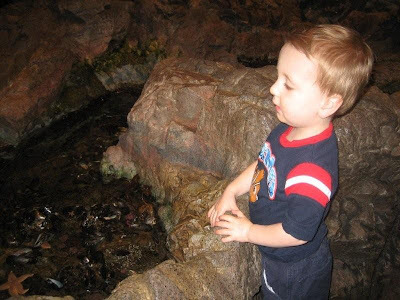 Babci filled Richie's weekend with lots of fun stuff - this is at the Aquarium. Lots of time outside - eating a hot dog (and the bun!) with his new penguin. And of course playing HOURS of hockey! And notice he is on his knees. He loves being the goalie. He thinks he is Tim Thomas from the Bruins and he sits to eliminate the 5 hole! Can't score on Rich! So we received good news today on the baby front. My previa has moved so I do not have to have a c section at this point! This means we have no idea when the baby will come, but I guess that is what you do at the end of your pregnancy....just wait. If nothing happens on its own, we do have a c section scheduled for June 11th. Hopefully things will happen on their own before that. 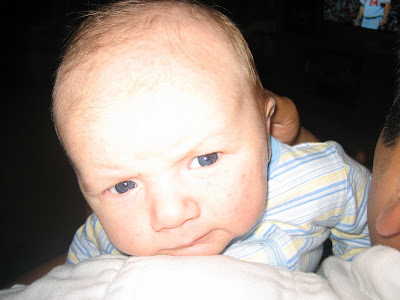 Mostly because the ultrasound tech said she estimates the baby to be 7 lbs 2 ounces already....UGH!!! 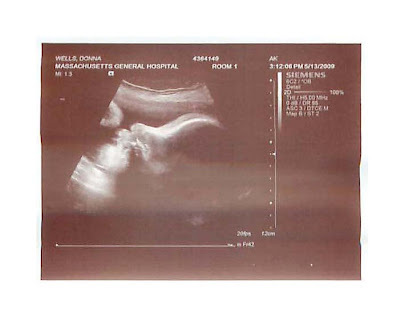 Here is our token alien ultrasound pic at 37 weeks. We spent Mother's Day in Monroe again this year and had a nice brunch with some of our favorite mother's!! It was a great weekend because Richie got to spend lots of time with his cousin Jakie! We had cake for Chris and Aunt Karen's birthday. The 2 cutest hockey fans!! The funny part is that both of these jerseys are actually Richie's and he LOVES and wears them both. He can't decide which team he likes better. The Rangers jersey was a gift from cousins John and Elisa. 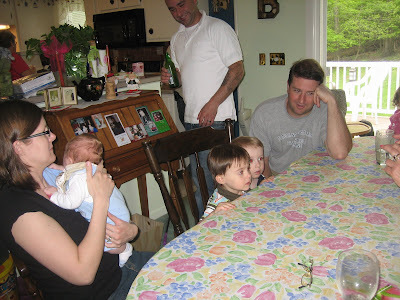 AnnaMarie, Jake and Richie being silly! Making a garden stone with the kids foot prints for Babci. It was a beautiful day for Joshua's baptism. They had a nice ceremony and then a fun lunch with lots of family visitors. Not sure how I missed a photo of the big man in his adorable white outfit, but here he is later that day. Godparents Aunt Sue and Uncle Kevin. The beautiful new Bujno family! We are excited that the weather has finally turned and it is warm!!! There isn't a day that has gone by without a trip to the park to play baseball. Babci came to visit this weekend to help finish getting things ready for the baby. We are going to have a very fun summer! Just 4 more weeks.